High protein. Omega-rich. Sustainably Farmed. Real Food. I recently sat down with long time friend Hannah Maloney who with her partner Anton are Good Life Permaculture, to answer a few questions for her blog. We discussed where we were at with Rebel Food Tasmania, and our insect growing and vision for the coming years. Hannah was one of the people I sounded out a couple of years ago when I was hatching the concept of growing insects for human food in Tasmania. Particularly her thoughts on food waste opportunities, how this could be a viable addition to our community and food systems...and just to see what she reckoned. She is pretty savvy and worth listening to. Pasted below is part of the interview. To see the full version of the chat check out the full blog here . Good Life Permaculture have great advice for designing and growing nourishing food gardens, food systems and bees. Yes, they also have bee hives! Who is Rebel Food and what are you up to? Rebel Food Tasmania is a new enterprise farming insects as human food. We’re doing things our way and a bit out of the ordinary as we’re working to a local food economy vision. We grow small herds in small spaces that we hope will have a big impact on food, reducing food waste, provide a new business in regional Tasmania, and bring a new premium product to the Tasmanian food scene. Farming insects isn’t a new thing. 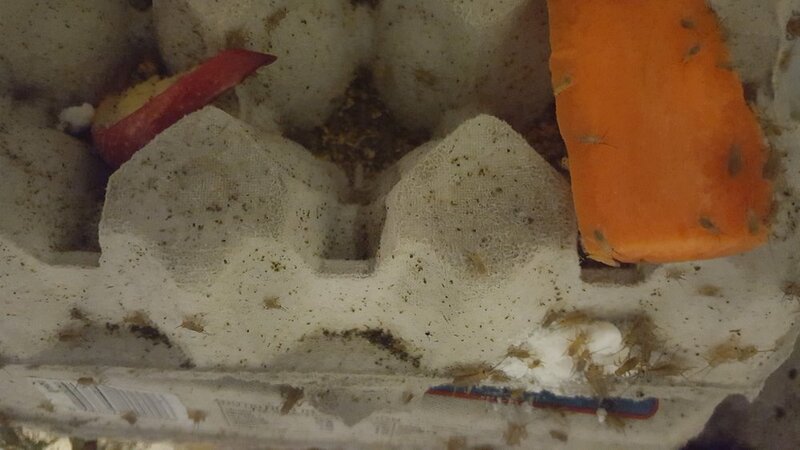 Right now insect products are being sold in supermarkets in Europe, the USA and are starting to take hold in Australia. And of course, let's not forget that 80% of the global population eats insects as a normal part of their diet. We are in the minority overlooking this source of nourishment. This past year we’ve been taking a fair bit of time to test our theories, learning from our mistakes and testing our insect end products with people who have expertise in nutrition, taste and what works out in the world. It's a big adventure, and so far we have been overwhelmed by the interest of other people and businesses who are interested in putting bugs on the menu. When it comes to protein production, how is farming insects better for our landscapes than farming larger livestock? There is a lot of media going around about insects being the super sustainable protein source of the future. The ability to farm these little critters in small spaces with minimal water, and on food waste is an amazing opportunity. That said we are also very mindful that what is used to power the temperature control systems is a major component of the energy and financial sustainability equation. It also needs to be named upfront that vertical farming systems can become intensive farming systems if done just for money, which does not do any favours to the animals being raised. This includes using fairly run of the mill feed sources, such as commercial chicken feed and other highly processed commercial cereal mixes to get them fat and fried as quickly as possible. This flies in the face of producing a nourishing or sustainable insect food, so we're doing it our way - with fresh food, a bit of extra time and attention to learnings. Part of the reason for doing a long period of research and development is to make sure we can actually grow and breed insects from farm waste, in temperature controlled systems that are viable and run on renewable energy, and that we are sure of both the quality of the insects on the plate, and that insect farming in Tasmania is actually a viable addition to the Local Food Economy. What insects are you farming and which one's your favourite to eat at the moment? The primary focus is on the domestic cricket (Acheta domesticus), for a flour product that can be included into foodstuffs in the longer term, and also to supply some early adopter restaurants in here Tasmania and Sydney for bespoke bugs on their menu. To add a bit of interest and variety, mealworms (Tenebrio molitor) and wood roaches (Parcoblatta pensylvanica) are also being grown because, well - why not?! Not to mention they all taste pretty great. As part of the research and development period, we are fact checking whether it's true that the insects take on some of the flavour profiles of what they have been eating. Short answer, yes they do. During pumpkin season and the apple season there was a detectable sweeter edge. Wine marc (https://en.wikipedia.org/wiki/Pomace) was an absolute winner for plumper, sweeter crickets (maybe a bit drunk too, who knows) while coffee grounds with mustard leaf is still a reliable foundation feed for giving a spicy edge. Not to mention carrots and root vegetables, they love the carrots as a moisture and food source. In terms of cooking them up: I'm really enjoying whole crickets as part of dishes, and doing a lot of cricket flour inclusions into baked goods. I'm loving the cooking experiments with mealworms as they have a slight cheesy end taste to them which rounds off dishes beautifully. The surprise of the cooking experiments has been using woodies, they are umami (https://en.wikipedia.org/wiki/Umami) powerhouses. A little bit goes a very long way. When can people start buying your product? We're looking to be on menus at select Tasmanian and Sydney restaurants early 2018 with bespoke insects grown for their needs. We will be doing targeted events where the importance of flavour and how the insects are grown is part of the story, while scaling up our systems to be making clean, green Tasmanian grown cricket flour as a key ingredient people can incorporate into their everyday dishes. We have some early adopters on the mainland and here in Tasmania including Meru Miso who are trialling fermenting our insects, Quartermasters Arms who have used all three of our insects species in pop up events and some of our state’s best restaurants ready to incorporate insects into their menu - as soon as we are public and launched. It's all a bit exciting, and a bit overwhelming!